Idaho has committed more than $100 million since 2013 to turn high school graduates into college students. Now, thousands of high school students can earn free college credits. High schools can hire college and career counselors to work with students and parents. And more students receive scholarships to attend Idaho colleges. But the money isn’t doing the one thing it was supposed to do. It isn’t improving Idaho’s postsecondary graduation rate, the state’s top education goal. The graduation rate remains dismal and stubbornly stagnant — five years and $100 million later. “That’s a lot of money for something where we’ve not seen outcomes improve, necessarily,” said state Rep. Wendy Horman, R-Idaho Falls. Horman sits on the Legislature’s budget-writing Joint Finance-Appropriations Committee, and plays a lead role in crafting Idaho education budgets. The two Idahoans who chaired a gubernatorial task force on higher education see things differently. Boise businessman Bob Lokken is surprised at how much Idaho is spending, and says there is no evidence that the money is helping improve graduation rates. State Board of Education President Linda Clark sees signs of improvement, from smarter approaches to college remediation to improved student retention at Boise State University. “There are places where we are showing progress, but that goal is really hard to nudge,” she said. To assess Idaho’s ongoing struggle to improve its postsecondary graduation rate, Idaho Education News examined five years of state budgets. College scholarships. The Idaho Opportunity Scholarship provides need- and merit-based scholarships of up to $3,500 a year. However, Idaho doesn’t have enough money to help every eligible student. The 2016 Legislature increased the Opportunity Scholarship line item from $6.7 million to $11.7 million. Total, 2013-18: $43.4 million. In January, Gov. Butch Otter conceded that the state hasn’t made progress in improving its postsecondary graduation rates. So Otter put together a 36-member task force to look at Idaho’s higher education system. Otter declined an interview request for this series. Advanced opportunities. In 2013-14, Idaho earmarked $641,000 to help high school students take dual credit college classes. Today, every high school student has a $4,125 line of credit to cover dual credit classes and Advanced Placement and International Baccalaureate tests. The program is growing rapidly, and beyond legislators’ expectations. Total, 2013-18: At least $20.3 million. College and career counselors. For years, school counselors have been overburdened — so busy dealing with discipline issues and helping troubled students that they have little time to help students with college applications or career planning. The 2016 Legislature responded with a $5 million line item, and increased it to $7 million in 2017. Total, 2013-18: $12 million. Complete College Idaho. This line item has covered a bevy of programs designed to help students succeed in college. Colleges and universities have used the money to hire advisers and academic coaches, to upgrade from adjunct faculty jobs or to revamp remedial programs. Total: At least $8.6 million. Student achievement tests. High school students must take a college placement exam in order to graduate — and since 2012, Idaho has made it free. Each April, juniors can take the SAT at state expense. The state also covers the cost for high school sophomores to take the PSAT, an SAT precursor. Total: $8.6 million. The total comes to $92.9 million — but that’s a low-end estimate. For one thing, the $6 million advanced opportunities budget for 2016-17 didn’t come close to covering actual costs. Lawmakers will need to take $6.1 million out of budget reserves to fill the gap. Considering this, the $7 million advanced opportunities budget for 2017-18 is apt to come up short as well. For another thing, the Complete College Idaho line item represents startup money, which colleges and universities used to hire staff. Now it’s up to the schools to use general fund budgets to keep programs going and keep employees on the job. And the State Board can’t calculate how much money that takes. Add it all up, and these five programs will almost surely cost more than $100 million over five years. Why is Idaho spending this money? That’s when the State Board established Idaho’s “60 percent goal.” The board wants 60 percent of the state’s 25- to 34-year-olds to complete some postsecondary program: a two- or four-year college degree or a professional certificate. The impetus was a 2010 Georgetown University study, which predicted that by 2018, 61 percent of Idaho jobs would require a degree or certificate. When Georgetown released its study, only 37 percent of Idaho’s 25- to 34-year-olds held a degree or certificate. Since then, things haven’t changed much. Even though Idaho’s political, education and business leaders have talked up the 60 percent goal. And even though the state has put big money behind the effort. More current data points are no more encouraging. This fall, 76,014 students enrolled in Idaho’s higher education system — the second straight year of increases, but down from a 10-year peak, set in 2012. In 2016, only 48 percent of Idaho’s high school graduates went on to college. Faced with the facts, Gov. Butch Otter’s higher ed task force walked things back. The high-powered 36-member group included several prominent business leaders, including Lokken; Idaho’s college and university presidents; Clark and the rest of Otter’s State Board appointees; and six legislators, including Horman. Before it began recommending changes to the higher education system, the task force officially abandoned Idaho’s 2020 target date for hitting the 60 percent goal, a deadline Lokken had long considered unrealistic. The new target date is 2025.
Who benefits from the $100 million? Without question, the state’s investments help students such as Anna Peterson. For senior year, Anna is taking only two traditional classes at Nampa’s Skyview High School. She spends the rest of her time taking career-technical classes in horticulture and animal science. The classes will give her a jump on college; Anna plans to attend the University of Idaho next fall, majoring in agriculture education and agricultural economics. She says she “can’t even imagine” majoring in ag education without the foundation from her career-technical classes. And she says the state’s $4,125 advanced opportunities money allows her to take more dual-credit classes than she could have afforded on her own. Anna also got her college placement exam out of the way on SAT Day. The free SAT wasn’t a dealmaker, since she says she’d been planning on going to college all along. After five years and $100 million, this story is telling. Idaho is a national “shining star” in dual credit enrollment, Lokken said. But the postsecondary numbers have remained flat, since most of the students taking dual credit courses were probably college-bound in the first place. High-achieving and “advantaged students” are probably taking the fullest advantage of the advanced opportunities money, University of Idaho President Chuck Staben said. But without programs such as dual credit, Idaho’s college enrollment and completion numbers could be even lower. “I’d hate to see us in that position,” he said. There is no disputing the popularity of Idaho’s initiatives. The 2017 SAT Day set a record; 19,323 juniors took the test, up from 18,069 in 2016. Thanks to the increase in state funding, Idaho awarded 3,716 Opportunity Scholarships in 2017, a number that has doubled since 2015. But scholarships remain scarce, to the chagrin of university leaders. In 2017, the state received applications from 2,851 qualified high school seniors, and 982 seniors got a share of the money. The State Board is seeking another $5 million increase in Opportunity Scholarship funding in 2018-19. “We still have a lot of unmet need,” board Executive Director Matt Freeman said. Dual credit has mushroomed. More than 22,000 students took at least one dual credit course in 2016-17. In 2009-10, as the State Board unveiled the “60 percent goal,” that number was barely 1,600. When students show up on campus with college credits in hand, they are more likely to leave with a degree. “Without question, it helps move them through more quickly,” Boise State President Bob Kustra said. 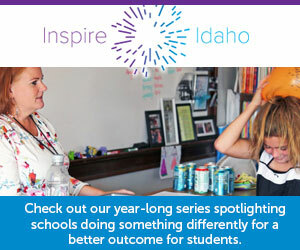 These programs — and the dollars attached to them — have changed Idaho’s education system. But is change necessarily good? Jewels Carpenter likes the state’s commitment to hiring additional high school counselors. As director of the Idaho Center for Advanced Technology, the Nampa School District’s career-technical center, she works closely with the district’s newly hired counselors. In the Blaine County School District, counselor Liz Clark says some students blow off their meetings with her — because they’re convinced she is just going to push college on them. She also worries about a one-dimensional focus, and like Carpenter, she wants her students considering all their options. Hired with Blaine County’s share of counseling dollars, Clark likes what the state is trying to do.